"T M Krishna is located in a beautiful place where he belongs to the pantheon of prominent musicians and is also an "insider-outsider" rebel with a cause." In its fifth year, the Prof. Ram Bapat Memorial Lecture Series saw the iconic and the iconoclastic Carnatic musician, T M Krishna deliver a lecture on the topic, "Am I Free? A Musician Questions". The lecture delivered in July 2017, was chaired by the eminent cultural critic, Sadanand Menon. The Lecture Series inaugurated by Sadanand Menon in 2013 in the memory of Prof. Ram Bapat, has since then, seen Mr Gulammohammed Sheikh, Prof Shiv Vishvanathan and Prof K Satchidanandan deliver lectures. In the backdrop of India celebrating seventy years of Independence this year, it was a timely lecture discussing the different conceptions of, and constraints to the idea of freedom in the context of Indian music. In sync with his characteristic unconventional ways, T M Krishna commenced the lecture with a video of his Poromboke song. The song is about the Ennore Creek in Tamil Nadu which is being polluted by the fly-ash dumped by the power plants nearby, and it tries to reclaim the pejoratively used word "Poromboke", meaning shared common spaces. For me, the lecture that followed was also, in many ways, about reclaiming spaces within music. By interpreting Krishna's ideas, we can conceptualise freedom as an act of reclaiming spaces for alternative imaginations that inform the multiplicity of this oral tradition. We can rethink the contours and content of ideas about ethics, the political, divinity, the every day, the spatial and aesthetics within Carnatic music. Diving straight into the heart of the matter, Krishna wondered, what freedom in music is, whether one is really free to "find one's own voice and create one's own music" in classical music, or does it just involve superficial tweaking around one's musical conditioning. This conditioning of the mind and development of an aesthetic memory of what classical music should sound like, is not a natural and organic process. Classical music has marginalised several diverse voices, to an extent that we have no aesthetic memory of them. It is no mere accident that classical music was developed by dominant castes at the cost of voices of other communities, including the Devadasis. Extending this line of thought, we can see how individual and collective freedom are intimately linked in classical music. Classical musicians not free from their own individual biases, and condescension towards "other" collective voices are depriving, the other communities, and also themselves, the freedom to revel in the endless possibilities of music. While talking about ethics in music, Krishna did not just focus on the regular suspects like social inequality, but on something very personal, very fundamental, Honesty. Krishna was candid enough to confess that, successful concerts and even those moments of seemingly spontaneous flights of imagination, are curated. One can extend the argument to wonder, whether those fleeting moments are basically manipulation of the senses, which is fine-tuned as a skill by the musicians. This is not to say that he does not believe in having a divine experience through music. Krishna is interested in connecting the realm of freedom of impersonal bliss with that of the constraining social, and political context we find ourselves in. The idea of divinity being based on ideas of purity and pollution, the upper castes get to define "the divine" and to own this "divinity". Therefore, music can elevate but the vehicle for this transportive experience is monopolised by the dominant castes. Krishna pondered if he can be free, and be in wonderment at the same time. Divinity in music is no longer relegated to brief moments in musical concerts. It is now being disseminated and claimed through secularised forms, such as the paraphernalia around music and through its pedagogy. Divinity seeps into classroom rituals like how to sit and what to wear, conversations between the "guru" and students, deifying the composers, maintaining "sanctified" sitting arrangements on stage, and so on. If we explore this observation, we soon understand that the mundane and the quotidian has become a site, where, what is profound and what is not, gets exclusively defined and claimed by the upper castes. Therefore, it is imperative to renegotiate the very definition of "what is profound" by allowing contemporary, this-worldly concerns of the society to seep into classical music. 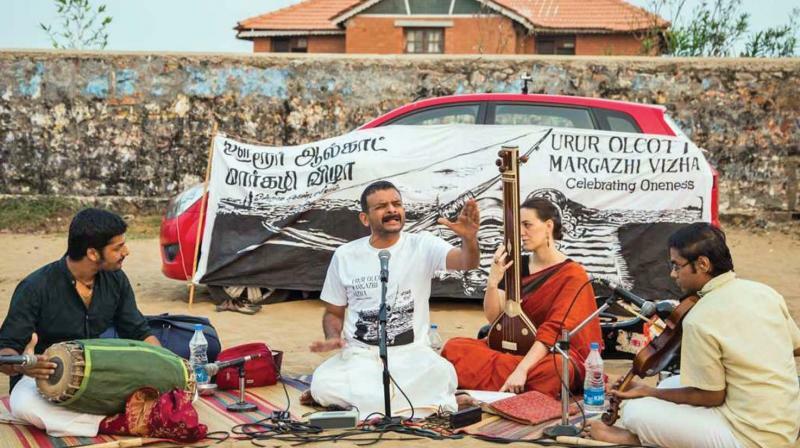 T M Krishna has performed on the Besant Nagar beach at the colony of a fishing community as part of the Urur Olcott Kuppam Margazhi Festival. Recently a small clip of T M Krishna singing extempore in a bus has been uploaded by a fan on Youtube. Such acts, large and small, reflect Krishna's experiments in shifting the physical sites, in which Carnatic music is performed in order to demystify Carnatic music as well as to reclaim physical mundane spaces for sharing collective experiences that are open to everyone. Carnatic music performed at temples was open for all. Today the music performed in "secular spaces" of auditoriums behave like "brahminical hubs", and are not open to everyone. We can deduce that moving away from seemingly cloistered religious space to a "secular" one, does not necessarily create openness and social equality. The invisible power play of secular spaces as opposed to visible religious discrimination, makes these secular spaces equally segregating if not more. T M Krishna in Urur Olcott Kuppam Margazhi Festival. After the lecture, discussions between Krishna and Sadanand Menon revealed some of unconventional experiments of T M Krishna and his colleagues. Poromboke song was written in Chennai Tamil. Krishna was glad to see how the cadence and textures of diverse languages and dialects, blended beautifully with the texture of Carnatic ragas on an aesthetic level. Krishna mentioned about another experiment where he asked the author Perumal Murugan to write a Carnatic composition about land, that has no irrigation (read secular topic) in a rural dialect. In a concert, Krishna happily plonked that composition in the middle of a Tyagaraja kirtana and a Dikshitar kirtana , which managed to upset people! Krishna also mentioned his friend who taught a child, a taal of three beat cycle, with a tennis ball. He made the child to bounce the ball off the wall in the counts of 1-2-3. The simple experiment demystified taala, and brought it into the secular realm, because beats are beats! Although restructuring and secularising raagas would be a completely different ball game. An article in The Wire by Sharada Ramanathan, argued that, T M Krishna should not have accepted the Magsaysay award, as he has hardly taken any concrete actions to deserve it. This argument simply misses the point. Given the "action-obsessed" political atmosphere in the country, it is rather easy to forget the importance of raising thought-provoking questions and layered articulation. In a situation where practitioners of classical music operate as gated communities, even the act of verbal dissent is a profound act of rebellion. As mentioned above, Krishna also continues to challenge conventional practices through various experiments that are neither small nor insignificant. Another line of argument can be that the artistic reputation of T M Krishna was established on the upper caste, upper class, male privileged background that he is now trying to challenge. It seems as a contradiction or even hypocrisy, but, it is neither of those things. In fact this is exactly the reason why T M Krishna is the perfect candidate to challenge the status quo. His dissent is taken seriously by everyone, precisely because he has the "legitimacy" of being a renowned Carnatic musician. Furthermore, he can lend his legitimacy to new perspectives as well as to peripheral countercultures within Carnatic music. Through his lecture, Krishna made the myriad conversations within the "high art" of Carnatic music, accessible to everyone. It is a rarity for someone to slip so easily into both roles of being a musician and an analyst; bringing an intimate viewpoint from within the depths of an artist's mind. Discussions on art and culture must occur within academic lecture settings, to sensitise a people for whom the classical arts may seem inaccessible. The nuanced but accessible articulation of Krishna allowed the audience to be receptive to the discussions, even when they were not connoisseurs of Carnatic music. T M Krishna is located in a beautiful place where he belongs to the pantheon of prominent musicians and is also an "insider-outsider" rebel with a cause. Seeing this as a contradiction, would amount to nothing but a naive and simplistic opinion, that would fail to understand the complexity of the relationship that we share with our culture. Making polemical arguments against classical music for being a brahminical culture and thereby dismissing it for being irrelevant, would not be democratic because it would do immense injustice to those communities who lent their voices and creative prowess to the classical music, but never got any recognition for it. T M Krishna's lecture made it clear to me that, culture and tradition are also shared commons like the Ennore Creek, over which everyone should claim equal rights and be its equal stakeholders. Sayali Thube has done an MA in Political Science with a keen interest in political economy, cultural history and modern Indian political thought. She is currently studying MSc in Modern South Asian Studies at the University of Oxford. She has also been a serious learner and aesthete of Hindustani classical music (vocals) for more than eight years.